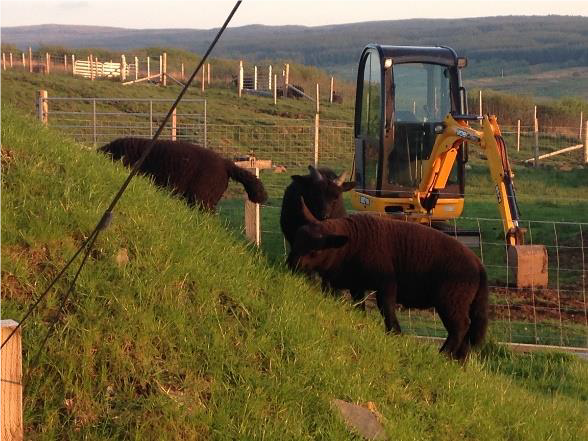 It was only half way through the year and we were already rushed off our feet with visitors and we were expecting many more, not to mention trying to find time to work on the house and tend to the rest of the jobs that needed doing on the croft. That’s why we employed our first ever full-time employee – Alexandra. Alexandra started out as ‘girl Friday’ as she loved coming to help with the donkeys and before we knew it she became girl Saturday – Thursday as well. 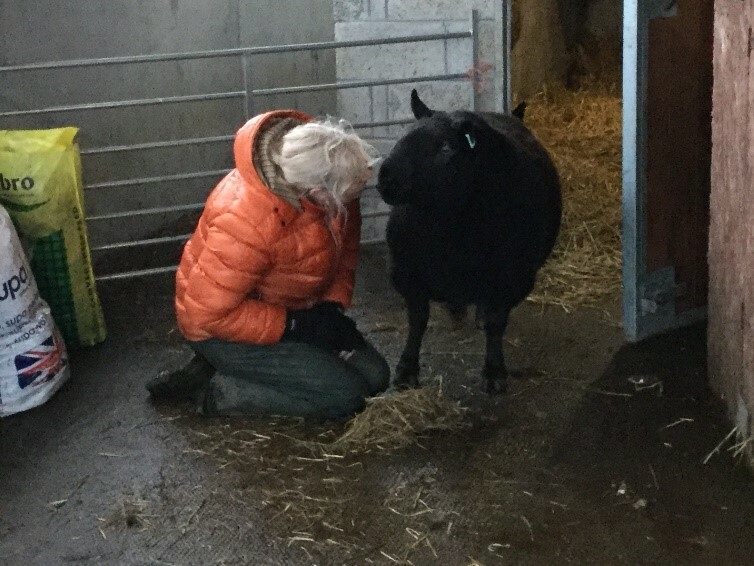 It has been super having an extra pair of hands onboard to help with all the visitors and animals, she is a wonderful addition to our crofting business and has been readily accepted by all of the animals too!! We couldn’t have wished for better. 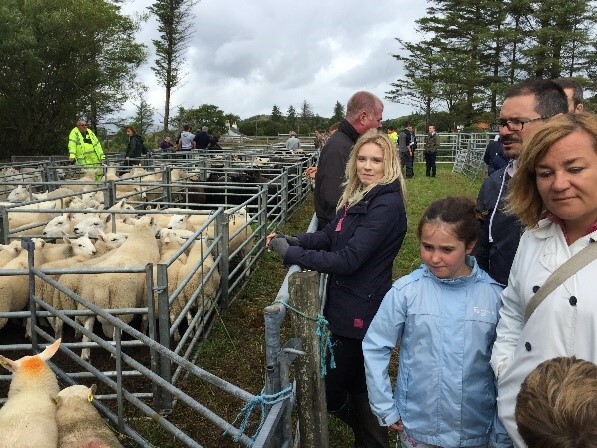 Once again, we attended both Dunvegan and Portree show where we showed our sheep. This year, to our surprise, the judge at Portree show liked black sheep!! This is a bonus for us as usually, judges are only interested in white sheep. He felt the breeding was excellent and I was awarded 9 second places for my Black Cheviot sheep. 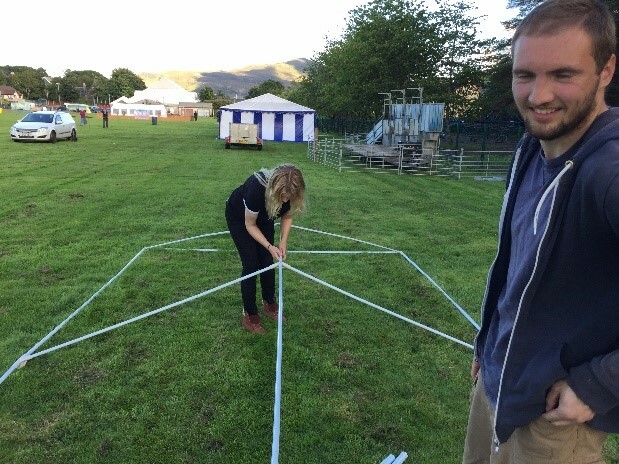 A huge success for us, especially when there were up to 16 sheep in the ring at one point. And the bonus, this year was that there were several more competitors at each show as had been in the past. We were also informed that we won 2 trophies this year, one of them is the most coveted ‘Crofter with the Most Points’ which I jointly won this year with the previous winner of the last 5 years!! We are genuinely delighted. On the 19th July it was exactly a year since Trevor marked out all the foundations for the house and a year on he was insulating the boot room. We can’t believe the amazing progress that has been made on the house. The 22nd of July was another very busy day for us indeed. 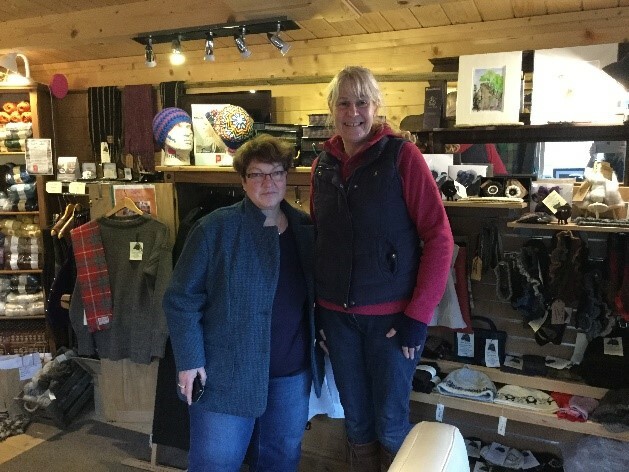 We started out the morning by welcoming ten Americans (mainly Texans) who are all avid knitters, spinners and fellow wool enthusiasts who came to the croft to of course meet the sheep, admire the fleeces and see the wool and products that we produce here. Cindy (who brought the group to us) and I had been in contact online for a while so it was fantastic to finally meet her, and she even brought us some rovings from her own sheep back in Texas! It was a pleasure to have them here and the exciting news is that they are currently trying to organise for us to go across to Texas later in 2018 and hold a Gansey course, in which we would design for them their own unique Gansey and teach them how to knit it – we are really looking forward to visiting this wonderful group of ladies in their home country. We were privileged to welcome, for the second year running, two groups in August who had come to Skye as part of their Craft Cruises trip. We took them to meet some of the boys before introducing them to the fleeces from our own sheep, as well as fleeces from different breeds from other crofters here on Skye. 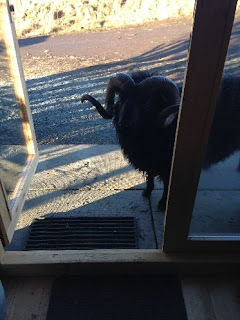 Finally, we took them up to the shop to show them the wool we produce from our own sheep and the products we can make from it, including Trevor’s famous Gansey. On the whole it was a lovely day, and everyone thoroughly enjoyed themselves, despite the dark overcast weather but that’s nothing new here. As well as independent groups we had visiting we also had many bus trips that brought visitors from every corner of the world to see us and get a tour of the croft. Trevor, Alexandra and myself take great pride in taking people round the croft and to see the sheep, giving all our visitors a taste of what it is to be a crofter and an understanding of the lifestyle here. The majority of our visitors have no experience working with sheep and some have never even seen sheep before, least of all black sheep, so this is something completely different for them to see and experience. Plus, it makes the sheep very happy with the extra treats they get when the visitors come to see them. 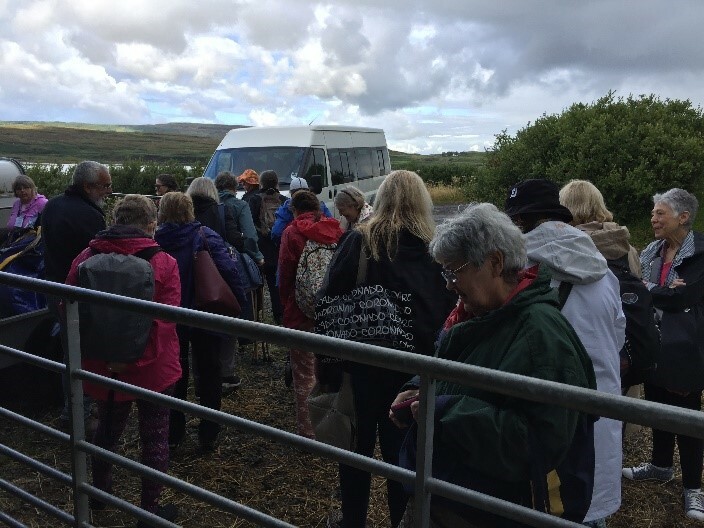 We have welcomed new tour operators to our croft this year including the newly formed Go Skye, a local tour group catering for individual and group travellers and also offering a new ‘Shuttle Bus’ to and from many of the major tourist attractions and sites here on Skye. It is only for us to say a huge thank you to the guys and girls who bring these tours to our croft and to the many, many visitors who have and continue to support our wee business here on the Isle of Skye. There was no slowing us down in September as there is never a dull moment on the croft. On the 18th September we had a group of 45 lovely American, Canadians and one Dutch lady who came to visit us on our croft as part of their Celtic Quilters Tour. They arrived shortly after 9am and their fabulous driver Rab is the only individual who has reversed a big bus all the way down the hill to our shop! 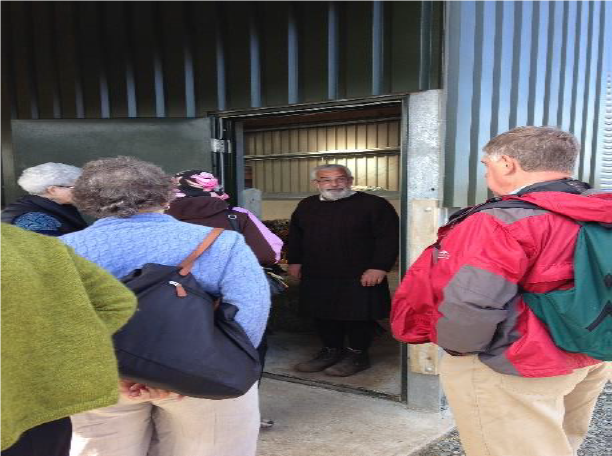 We took them all to meet and feed the sheep before splitting them into two groups. 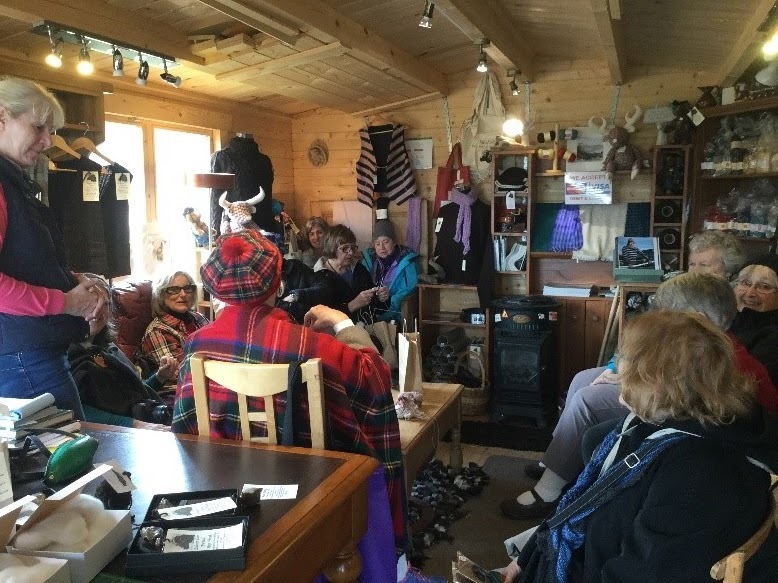 One group went down into the shed where they got to see the fleeces, find out about crofting and participate in a spinning demonstration, as well as there being a small quilting exhibition for them to see. The other group came into the shop to see Trevor’s famous Gansey and the fascinating story it tells as well as being able to see all the other products we design and make on the croft. 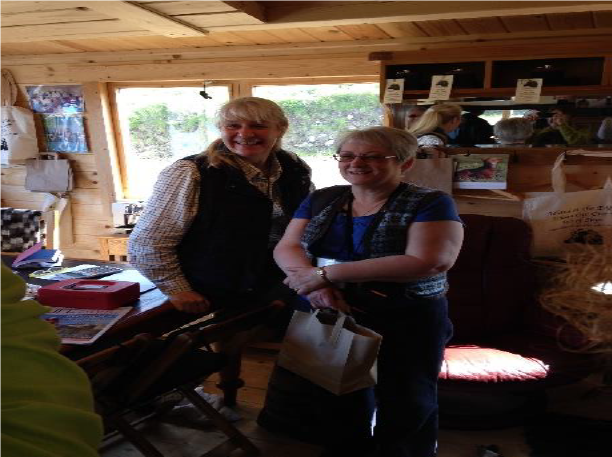 The groups then switched and they were treated to coffee and home-made cake, an essential for any visit to our croft! We were honoured to have them here and Trevor, Alexandra and myself had a splendid day – not to mention it was a beautiful sunny day and it didn’t rain. 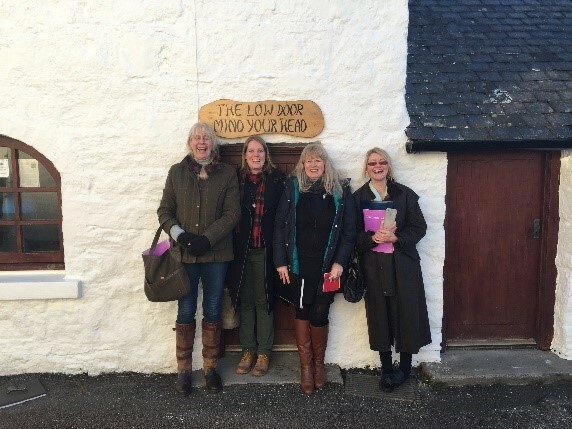 At the start of September we also held one of our Gansey courses which we had 4 ladies on, all who did exceedingly well (one of whom is now finished her Gansey). They were with us for three days and everyday we were in tears from laughing. 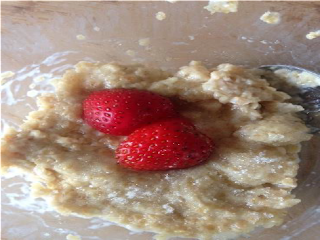 As part of their package they receive home-made soup each day for lunch as well as cake and endless cups of tea and coffee. 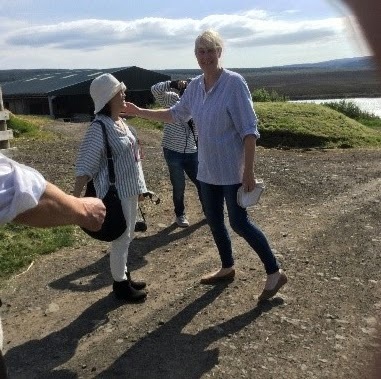 On one of the days the group was in we also had a visit from a Japanese film crew who were making a tourist film encouraging those in Japan to come to Skye. 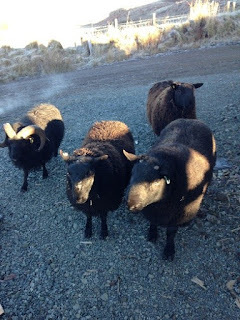 They filmed our knitters working on their Ganseys and of course no visit to the croft is complete without meeting the sheep, so we took them up to meet and film the boys! 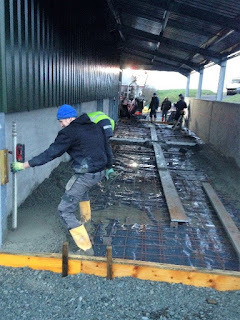 A few of you may remember Norman and boys from the hard work they did for us last January putting the concrete into the lean too, well they were back again this month but this time putting up the concrete blocks outside the framework of our house. We had a further two Gansey courses this month with more fabulous knitters. One of the Ladies who attended, Lee, had come all the way from Canberra and taught knitting over in Australia (no pressure) but had never knitted a Gansey before. Another exciting event this month was the Royal National MOD which I participated in with the Portree Gaelic Choir. This year it was held down in Fort William and despite the fact there were more competitors this year we managed to achieve our best results yet. 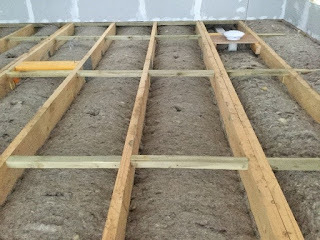 In the house we have installed sheep’s wool insulation, for which we are now stockists here in the Highlands and Islands. 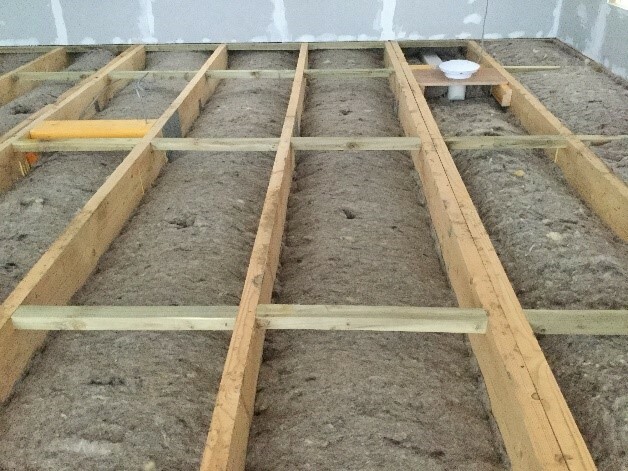 This wonderful product – Thermafleece, is far more environmentally friendly than the ‘rock wool’ a man-made fibreglass product that has been used to insulate houses here for decades. We have returned to the traditional – which makes sense as we are in the business of sheep wool. We have progressed further than the insulation and now have walls and doors in the house too, as well as having installed nearly all of the bathrooms. November was another exciting month for us, not least because we expanded our sheep family. Trevor and I set off to Inverness to buy curtain poles, however it happened to be the day of the rare breed sales in Dingwall and this wasn’t an opportunity to be missed. 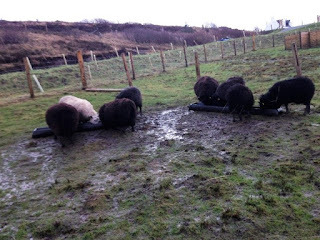 By the end of the day we didn’t make it to Inverness but did come home with four new sheep. 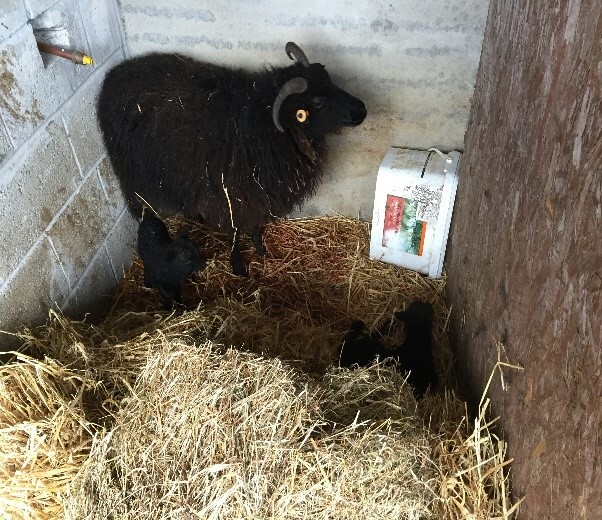 These came in the shape of two incredibly rare North Ronaldsay lambs, a ewe lamb named Peerie Lass and a tup lamb called Thor. 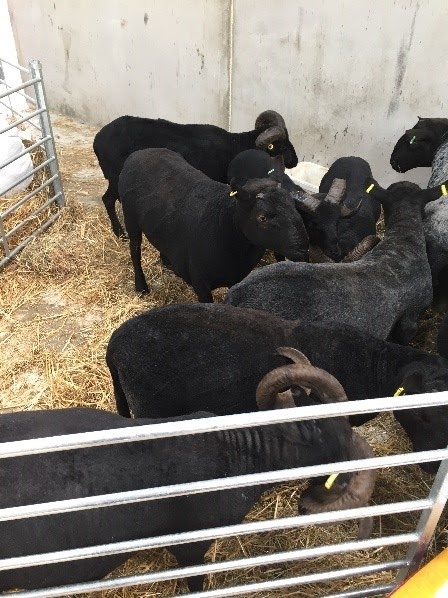 The other new additions were two 'white' Cheviots who came from the Queen mother’s estate, Mey and Ealasaid (which is the Gaelic for Elizabeth). 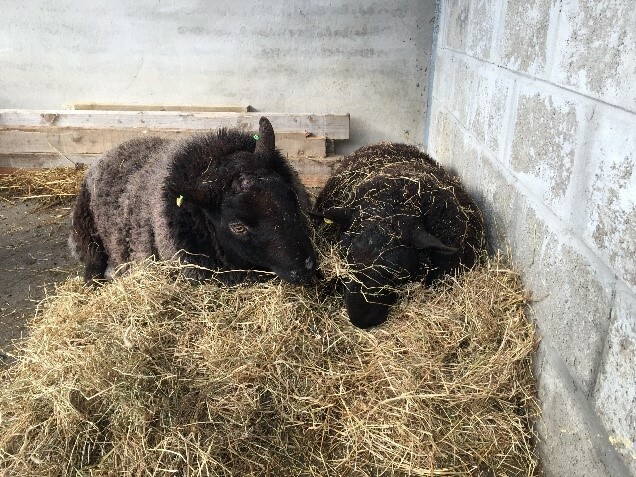 We purchased these two fine girls as they have a Black Sire and Black Dams so this will add a new 'black' bloodline to our already successful flock of Black Cheviot sheep. 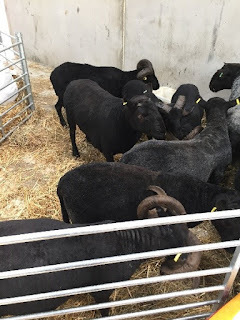 This also means in future we will also be able to sell our own North Ronaldsay yarn as well as the Hebridean, Black and now White Cheviot wool also, watch this space for more details on our wool stock as it arrives. 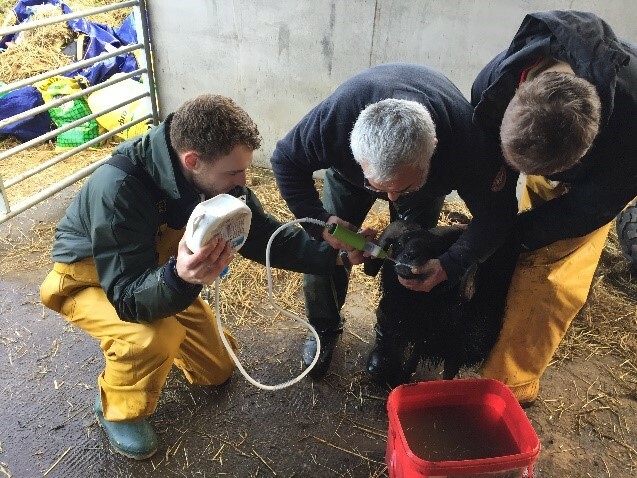 November is also 'tupping' time, so many of our boys go away out on hire, some have been with the girls here, so hopefully we will have a busy month in April with lambing, especially if they all have twins! Harry listening to his pep talk before he goes! 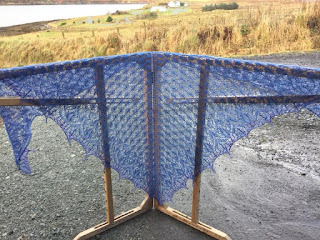 At the start of November I did a talk down in Broadford for a ladies group. 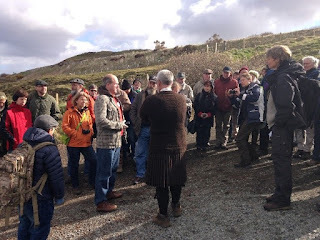 The talk was about what we do here on the croft, the business and crofting diversification. I also discussed my incredible trip to Japan last year and the opportunities this opened up, including when we hosted them here back in May. 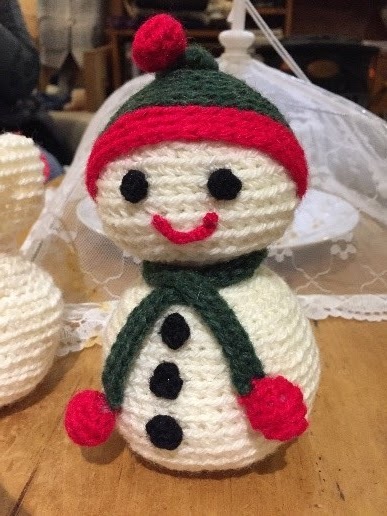 A snowman one of our beginners made! 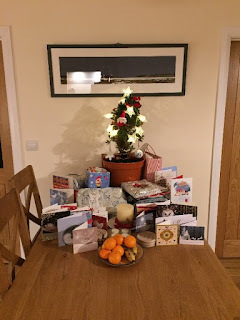 On the 9th of December it marked the four-year anniversary since our house on Colonsay was lost. 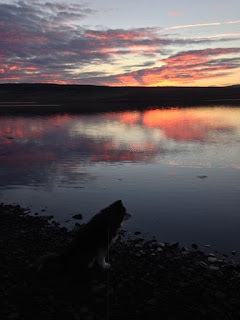 This gave Trevor and myself the opportunity to reflect on the hard work it has taken to get to where we are now, and we are so grateful for all the support and kindness we have received from Crofters, locals and those further afield, so thank you to all. The exciting news now is that we are now staying in the house! After all of the hard work and the occasional hiccup, and the floors/carpets have been laid courtesy of Harris Home Furnishings, we now have electricity, the furniture has arrived and the Rayburn is working. This means after a long and hard days work outside in the bitter cold weather I can go and put my feet up in a warm and cosy house, finally! The water is connected too which is brilliant as we are able to enjoy a nice hot bath. 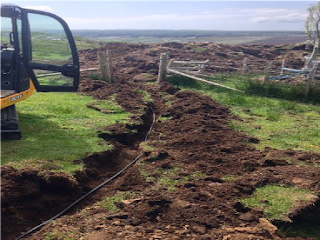 A big thank you to the talented young plumber and crofter Kenny MacKinnon who has worked incredibly hard since the Summer to help get us to where we are now. 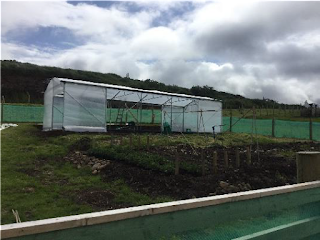 During the installation of the Megaflow water system Kenny created a masterpiece of pipework, so much so that some friends of ours have asked for it to be replicated in their own house - well done Kenny! Although we are staying in the house there is still plenty of work to be done. December may be quieter in terms of visitor numbers that doesn’t mean we get a break, quite the opposite! There are endless rounds of feeding and looking after the animals as well as the usual work to be done, which all has to be squeezed in during the few hours of daylight that we have. Alexandra is such an asset to us, and works well with us to achieve all that needs to be done in a day! Occasionally, she can be as muddy as I and we convince ourselves that the 'mud' is good for our skin!! We have to feed the animals because the grass stops growing over the Autumn and Winter so we have to supplement feed all the animals with Hay and mixed grain for the sheep and hay, barley straw and hard feed for the Donkeys and we hope this keeps them all healthy over the winter. We have made a vast range of different products this year which are available in our shop, as well as our usual favourite items. This year we have produced little sheep fridge magnets on cards that are wrapped in the wool, we have also been busy knitting to produce a variety of Fairisle hats and Shetland cardigans. 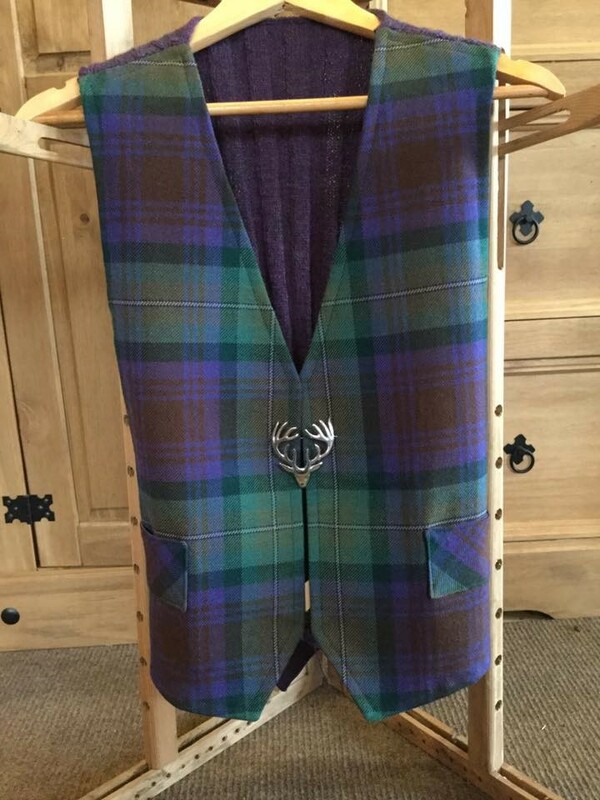 A first for us this year was that we were commissioned to make two different styles of bespoke tailored jackets out of Harris Tweed, with the customer coming all the way from Germany to have made, which turned out very successful and the customer was thrilled with. Trevor, Stamford and I had a lovely quiet Christmas down in the house this year, complete with my Christmas tree that I have been growing over the years. 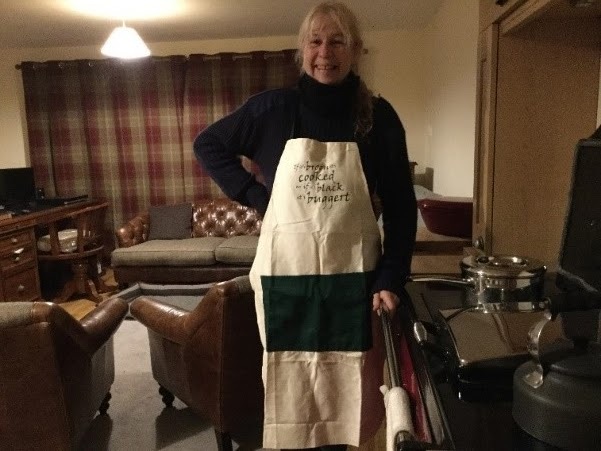 At least this year I was able to cook my Christmas dinner in a nice warm house and we could sit at our dinning table and enjoy the stunning views over Loch Greshornish. We also took a much-needed break between Christmas and New Year, although there were still the animals to attend to every day, but it meant we could catch our breath and prepare for the busy season ahead, as well as all the big changes we have in store for 2018. Follow us on Facebook, or stop by and visit us here on the croft to see what we are up to! You might need to take a seat for this one!! We have exciting news to bring you! After sending the wool off way back in August, the Black Cheviot wool has finally been delivered. It is a beautiful dark brown with a subtle grey fleck and is ideal for hand-knitting, crochet and other craft skills. We ship worldwide so please get in touch if you are interested and we will happily send it out to you. Another New Year rung in our caravan, but with the hopes it would be our last in our trusty ‘tin can’. Despite the festive season we haven’t rested here as we have been very, very busy on our house site. So much so, we have been able to complete the foundations. 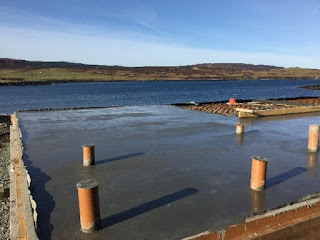 Neil – one of the Bernisdale Boys, Norman, Dave, Cammy and Ross in his concrete wagon, Trevor driving the dumper and Calum driving his tele-handler all arrived one morning at 06:45 ready to pour the final layer of concrete which will make up the finished floor of our home. 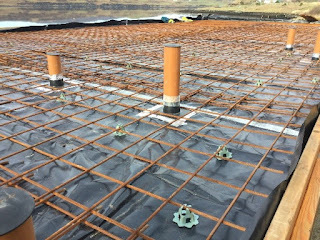 Preparations prior to the pouring of concrete included fitting a steel frame to help support the concrete slab. 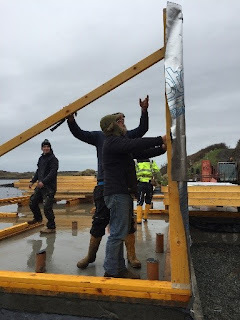 We have waited 2 years for this day as we had to monitor the tides and the sea defences we put in to be absolutely sure that the site will never flood, and it will be just perfect. 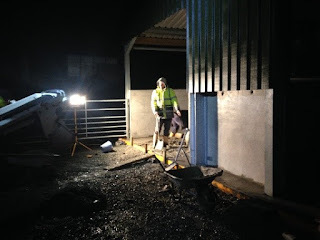 The boys worked well into the evening but as the temperatures dropped we hoped that the concrete would be ok! Neil and the boys arrived later that morning to smooth out the top of the concrete and were happy that everything had worked out extremely well for us. 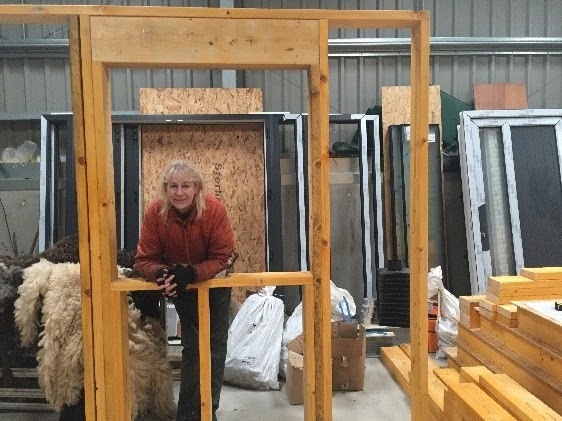 Trevor has worked tirelessly to build the individual wooden house panels, helped only when he hurt his back then Calum and his boys came to help. 34 panels needed to be built in total and one in particular, that Trevor built, needed 1000 nails hammered into it!! This particular panel I am looking through is for the kitchen wall and what will be my Kitchen window! 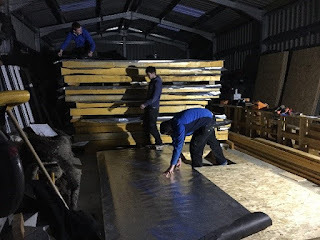 Calum and the boys are putting the waterproof membrane on the outside of the panels for us. Notice it is quite dark in the shed, this is because we have to work with portable lighting, it is dark here during the winter as early as 2:30pm in the afternoon! Some sad news to bring you this month though was the tragic loss of our beloved tup Ewan-San. Through circumstances out with our control we lost one of our best tups, with his magnificent horns and top-quality fleece (not to mention his lovely nature), he will be sorely missed by all. We are delighted to tell you that our house is standing as a house and is no longer in pieces in the shed!! 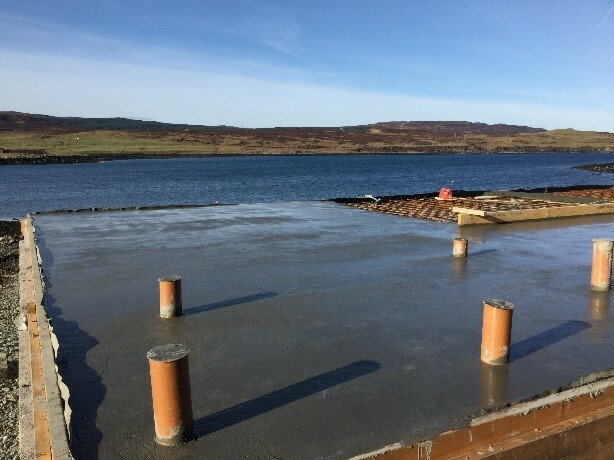 The concrete floor was put in and on February 24th Calum MacRae our neighbour and local joiner and his team began to erect the panels down on the house site. 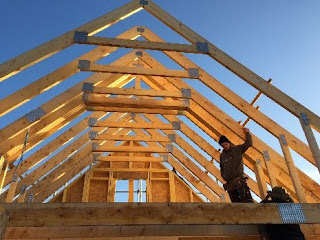 Trevor built nearly every panel himself, so it was obvious he had to put up the very first one. The ground floor panels were up in no time at all, closely followed by the roof trusses which had been strapped to the sides of a big blue container over the winter months, just in case they blew away. As well as working on the house we have been doing plenty of work on the croft as well. We have been working a lot more with the donkeys and they are now quite happy for us to walk up to them and give them a good cuddle, Muffin in particular loves her chest scratched, and they are more comfortable around new people as well. We have also been working on their halter training and now take them short walks around the croft, so they can have access to some fresh grass, which of course they love and are usually well behaved for. This is huge progress from when we first got them, and we are looking forward to seeing their continued development. 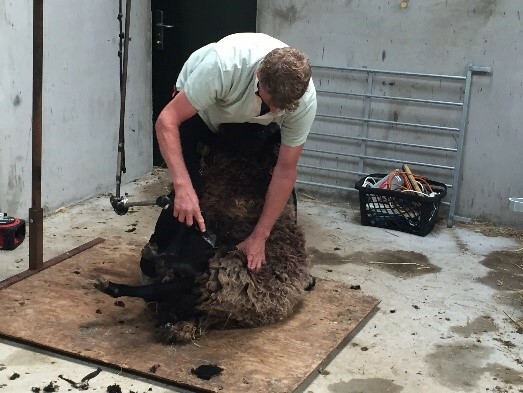 We have also been working with the sheep, bringing the boys in for a much-needed pedicure and their annual medication. 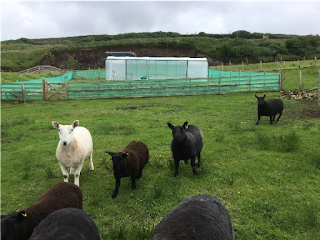 We were ably assisted by Euan, who helps us quite a lot here, he is a learner crofter and is working and saving hard to purchase his own croft. 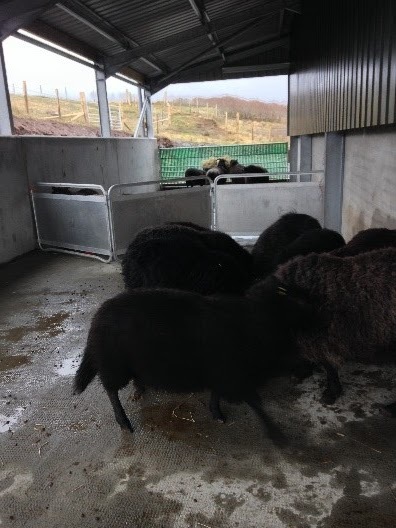 He is also working towards his crofting qualification which Trevor and I have been helping him with the practical side of things. We also had a young chap called Hedser who came all the way from Friesland (Netherlands) to help out at Dunvegan Castle as an Intern with a specialist painter who restores paintwork. 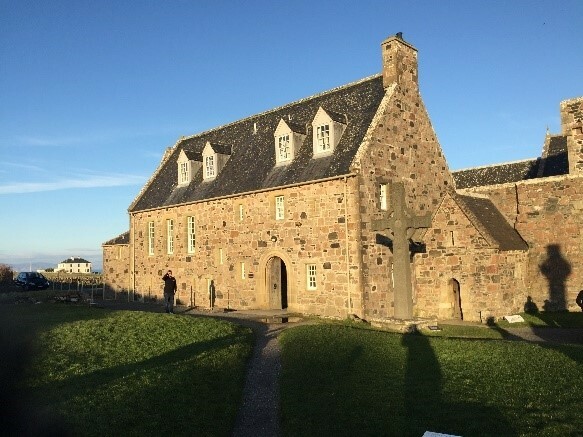 He wanted to find out about Crofting, so our friend Jeroen, the custodian of the castle contacted us and asked if Hedser could come along to help. He really enjoyed working with the animals and both Euan and he helped me with the weekly mucking out of the donkey stable – I was very grateful indeed. Trevor, Euan and Hedser giving the wee man his oral dose of medicine and Ralph Percy and his son Big Laddy enjoying the hay after they had their medication. 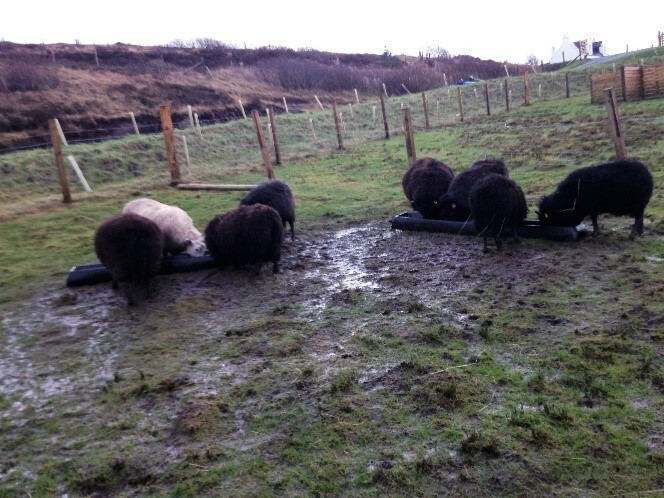 They wouldn’t allow any of the other boys into the hay – greedy boys. Our house is now classed as ‘wind and water tight’ which means the only job needed for the outside is the breeze blocks, render and a coat of white paint then the house is secure for all weathers. 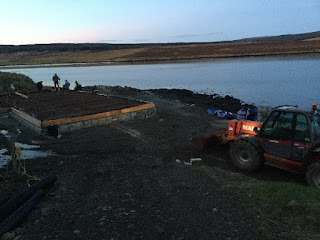 This last push won’t be until later in the summer when we have saved enough for the blocks and for Norman, Dave and Neil to come and lay them for us. With all the current work being completed on the house, I managed to take a tiny wee break away with my friends on the Isle of Iona. 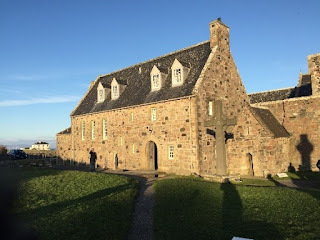 The four of us were invited to sing in the Abbey with Siosgeul – the Gaelic Gospel Choir. What a privilege to sing in the Abbey with some other wonderful singers including the very famous Gaelic singer Joy Dunlop and Mary-Anne Kennedy. We did a workshop with a Gospel Choir Conductor all the way from London, where we learned songs they would sing, then these were translated into Gaelic. We finished the evening with a Ceilidh in the local village hall, where there was dancing, singing and general merriment. A good time was had by all as we left Iona first thing on the Sunday morning. Our second ferry from Craignure to Oban wasn’t until much later in the afternoon, so we had time to visit Ardalanish weaving house. They weave their own tweed from their own flock of Hebrideans, it was lovely to meet them, especially while we lived on Colonsay they were our near neighbours. I have also been getting commissions ready. Many of my hand-knitted garments take time to make, mainly because they are knitted on fine needles and have lots of patterns. I have just sent a commissioned Hebridean wool Gansey to Italy, which took me nearly 200 hours to complete. 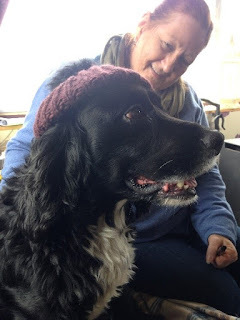 Then a Gansey and Crofters sweater, made from pure Hebridean and Black Cheviot wool were sent to New York, closely followed by a Tam-O-Shanter (traditional beret type hat) sent out to Denver and wrist warmers to England and Germany. 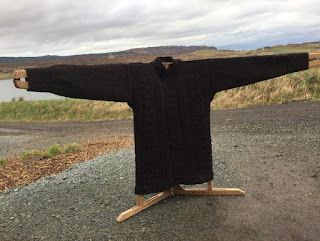 I have a white Kiloran to block ready to send out to Minnesota, and one white and one black Kiloran sweater to sew up and block ready for the Lake District. I then must order the wool for some Fair Isle cardigans I’ve to make, some are for Japan and others for the UK! Plus, we are still getting bus tours down each week, so myself and my knitters are working hard to get beanie hats and wrist warmers made too. Lambing time again… Trevor and I take it in shifts to check on the ewes and sure enough, I was checking at quarter past five in the morning when Tessie was lambing. Out popped a lovely little ewe lamb, a first for Tessie, as she has usually produced tups (boy) lambs. 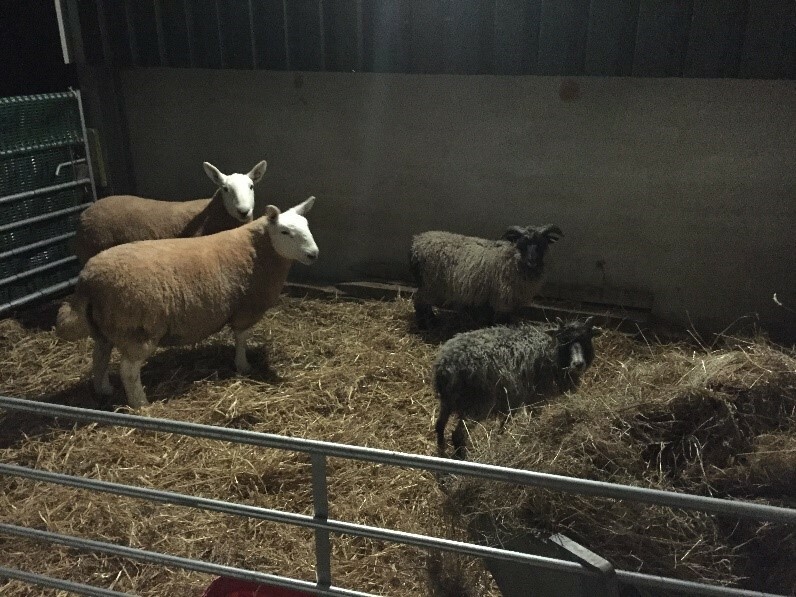 Trevor came down to the shed at quarter past six in the morning and she began again with a second lamb – another first for her, she has always produced singles. Sure enough, the same as last year, a small tail appeared!! This is not what you want to see, you want to see a wee nose and two front feet, so we knew this was another breech birth (backside first) I had to hold Tessie down while Trevor managed to find a wee foot and out popped a little tup lamb. In the meantime, we had let Marsaili the Hebridean out into the field, and blow me, didn’t she just deliver a tiny ewe lamb within minutes of Tessie! We managed to bring her in too as the weather wasn’t particularly nice, and didn’t she go and have a second ewe lamb too! 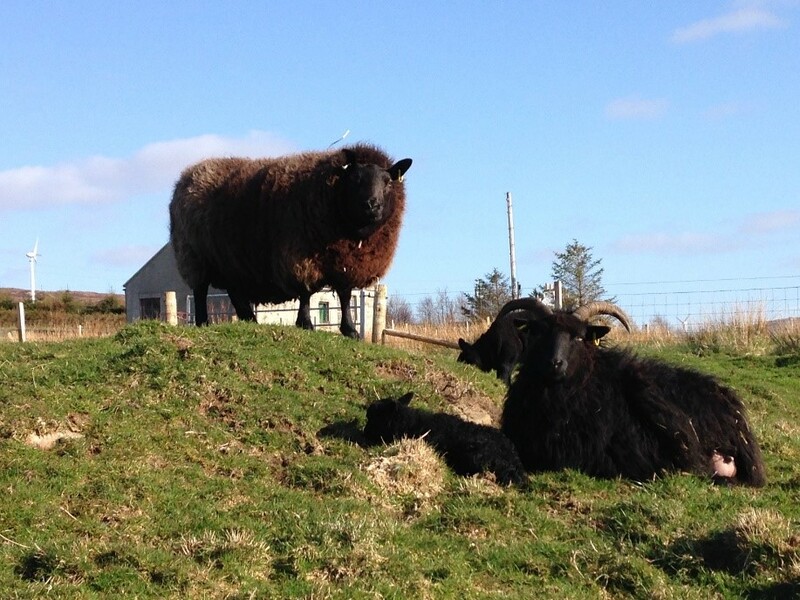 This is also unusual as this was a first-time lambing for her and she also had twins. Ironically the father of the Hebridean lambs was Ewan-San who sadly passed away earlier this year, so at least we have his progeny in two lovely little girlies. 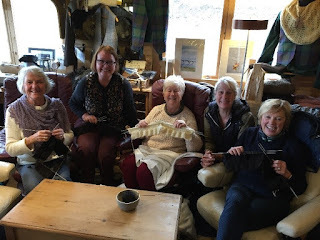 We also had a lovely group of Americans who came to visit us on the croft in April, there were 20 of them in total who had come all the way from Pennsylvania and all had connections to a knitting shop in Pittsburgh. 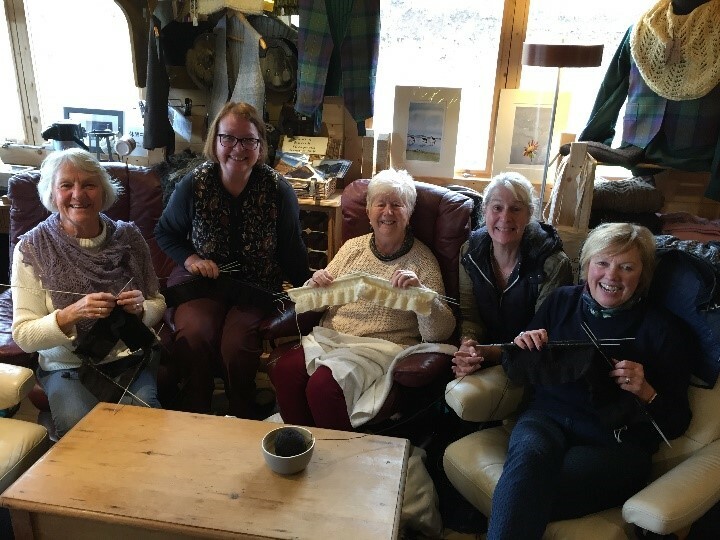 Whilst they were here they learnt all about what it takes to be a crofter, knitting in the round, Fairisle knitting and were given a spinning demonstration, as well as an opportunity to give it a go themselves. 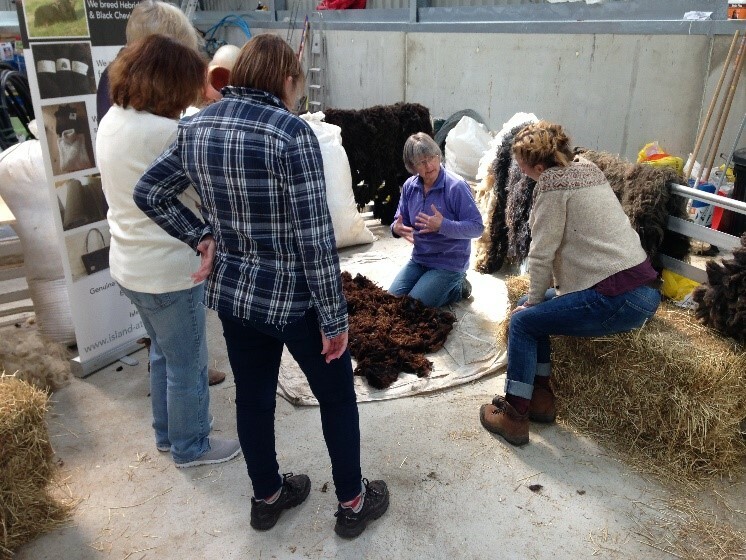 We brought in one of our expert Tutors Pat to give the demonstration and help the ladies to take away some hand-spun yarn of their own. 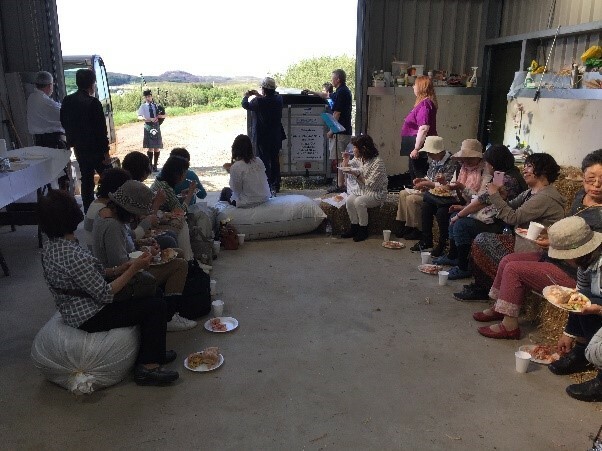 May was a big month for us because we had some very special and much anticipated visitors come to see us and that was our friends from Japan – there were 22 of them in total! They are readers of the Japanese magazine I write for, Mr. Partner which is about all things British and they came over here as part of the Mr. Partner tour. Before they arrived, we had spent all afternoon in the kitchen preparing a feast for them, this included the best seafood – Langoustine and Cullen Skink (an East Coast delicacy) made using fresh ingredients off the boats in Portree that very morning and supplied to us by our dear friends down at ‘Just Hooked’. Luckily it was a beautiful sunny day and when our guests arrived we took them to meet the sheep and introduce them to the fleeces and explain about what it is we do here. After this we took them down to the shed where we provided them with entertainment. This came in the form of a young and very talented piper from Edinbane (Archie Maclean – aged 13 years) who is a pupil at Portree School and also some Gaelic singing by Uiseag (Skylark) a small Gaelic band which is a spin off from Portree Gaelic Choir in which I also sing. 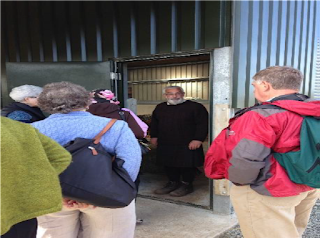 I believe the group didn’t know anything about this – only Jeffrey the tour guide. It was a nice surprise for everyone. Although we didn’t have that long with them, we managed to pack a lot in and everyone had an amazing time and we look forward to them visiting again one day. Happy New Year!! We wish you a healthy, happy, safe and prosperous 2017. We would like to take this opportunity to thank each and every person who has visited our croft this year, whether it was via tours buses with amazing tour guides, our fabulous overseas visitors came from all corners of the globe. 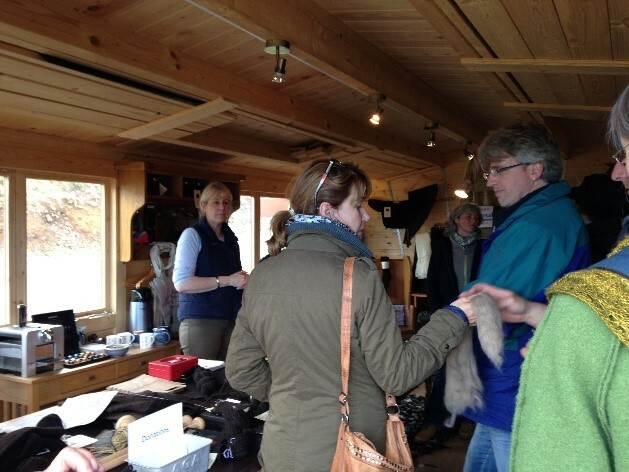 Our local, regional and national visitors who arrived from all corners of the UK and whether your visit was to pop into the shop, meet the sheep or participate in one of the several courses we ran this year.. Thank you. We must also say a very special thank you to all of those tradesmen and suppliers who without whom none of what we have achieved would have been possible. We would like also to say a huge thank you to our family and friends who's ongoing support is just amazing... Sometimes we feel overwhelmed with the kindnesses we are shown and we can hardly believe that another year has passed and the progress we have made here on the Croft is just immeasurable!! So here is a brief look at 2016 here at Eilean Oir Croft, Isle of Skye. Last New Year’s Day (2016) we were up with the larks and did our usual chores – feeding the sheep and walking the dogs ironically, we first footed ourselves (as Kapitein was once upon a time a very dark haired guy - as per tradition - and as we did last year) so here’s hoping we have as good 2016 as the previous year. We did receive visitors later that day. Then off out again to feed the sheep again. Thankfully we didn’t have to dig drainage ditches this year. 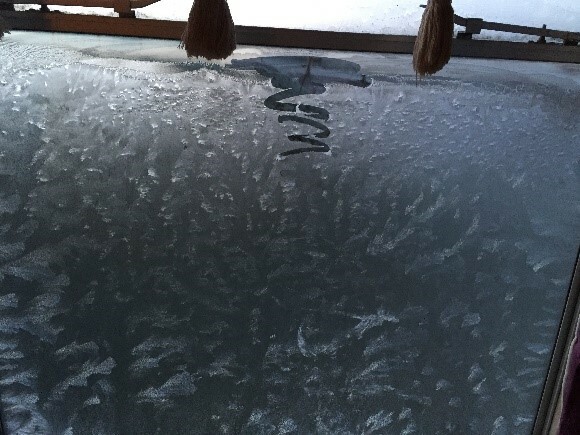 Ironically, we have had some lovely weather here during the month of January – a refreshing change. 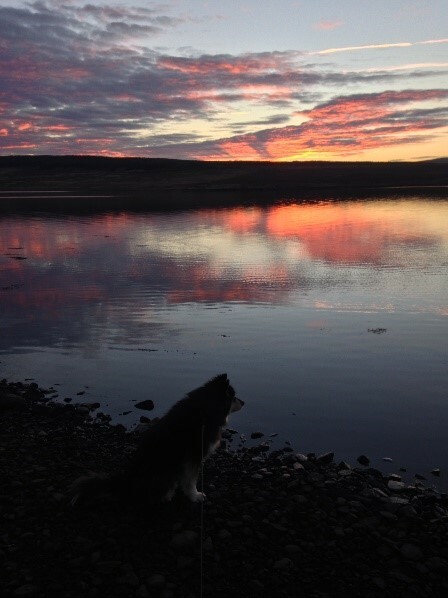 Here is Stamford aka Wolfie watching for seals on the sea shore just as the sun was setting. Storm Gertrude struck Scotland in the latter days of January!! We had winds in excess of 80 mph! And mainland Scotland has had gusts in excess of 125mph!! Even the Forth Road Bridge was closed. 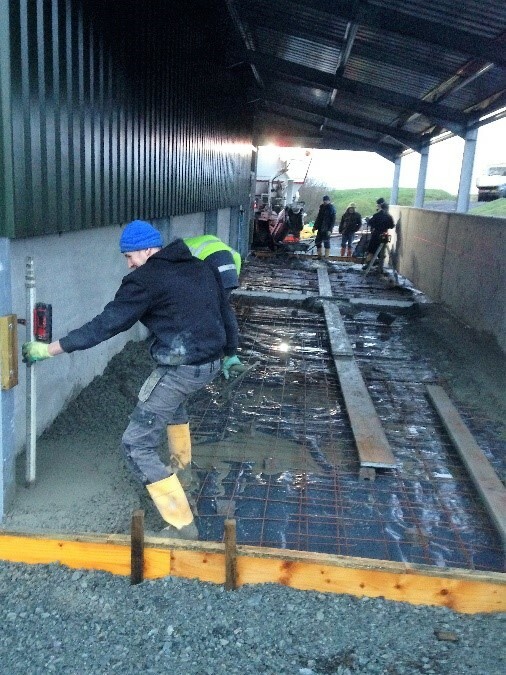 Ironically, yesterday was the day the concrete floor was being laid within the agricultural shed! The wagon came down at 07:30 yesterday morning and after three and a half loads of concrete he left and just before 10:00pm last night. Neil Montgomery, another fabulous tradesperson from Bernisdale another friend of John MacLeod, arrived with his team and they barrowed and tamped down the concrete all day. The only break they got was when the wagon had to go to refill with cement, gravel mix and water. Cammie barrowing concrete into the lean too. 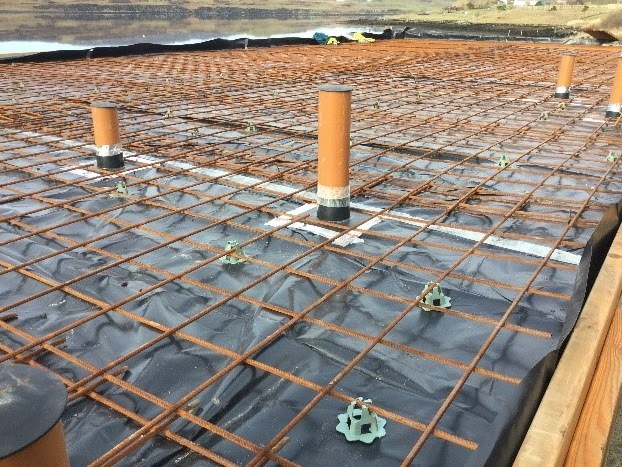 What we didn’t know was that once the concrete was laid, they needed to use a ‘polisher’ (they call it a Helicopter) which would smooth and even out the top layer of concrete to give it a good finish. Ah, but, you have to wait for the concrete to dry! These guys worked, worked and better worked well into the night. At 11.30pm, Neil said that they would have to come back through the night to finish the job as the concrete just wasn’t quite dry enough!!! You can imagine our amazement! True to their word, they arrived back at approximately 01:00 am and worked until 4:00am in the morning. They did this amid storm Gertrude with the winds howling and the rain lashing down. They are truly an outstanding team I am sure you will agree. And the shed base is amazing, just perfect!! 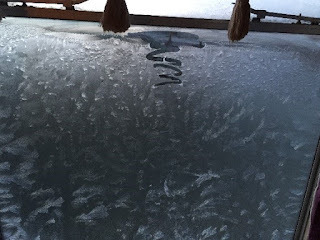 We were up very early one morning because of the very high winds. We had a severe electrical storm at around 06:30 am and the lightning struck just above the caravan!!! We were very lucky indeed, we both just got a very big fright at the huge ‘crack’ as the lightning struck. Thankfully all was well. As soon as it was light we were up checking for any damage and we were then able to go and see that the sheep – and the hens were all ok. I am pleased to report, barring a waterlogged field, due to the subsequent deluge of water, all was well. 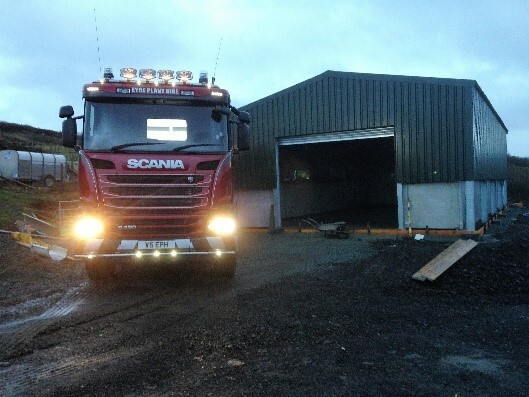 The new Agricultural shed completed, and as the winter weather was quite harsh, we moved the sheep into the purpose built lean too. I think they thought it was a Palace! We put the girls at one side and the boys (in the foreground) in the other. I know they were very comfortable as they didn’t wish to go out into the paircs in the morning! I was working in my workshop when the ‘Big Fella’ decided to pay me a visit!! I don’t know if those of you who have visited us here will remember that we had some trees between the caravan and the shop? Well, our old friend Magnus and a ‘tree surgeon’ Ali from Staffin came to inspect them to find that they were extremely dangerous! We did suspect this as they weren’t your average tree! They were in fact overgrown Leylandii hedging, planted over 25 years ago. During high winds, one of the trees lifted the land surrounding its roots as it swayed with the gusts of wind! This is not a protected species of tree (as it was never supposed to grow into a tree). The decision was taken to clear fell the trees for our safety. We decided to have the trunks logged and the remainder was fed through a machine that chops up the leaves and branches to make chippings – these are suitable for composting and making natural walkways. 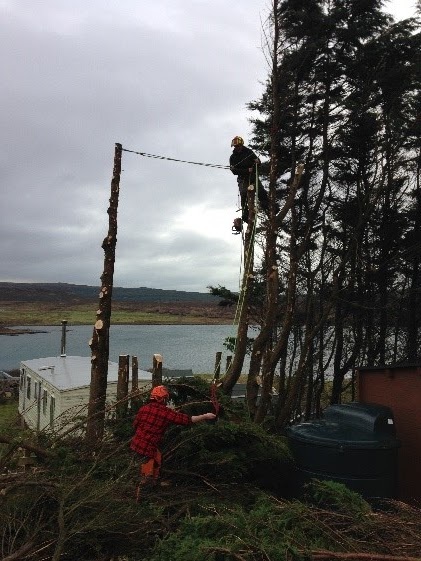 The day came and Ali had to go up the trees to remove the thicker branches to secure them so as they wouldn’t fall onto either the caravan or the shed! He was amazing to watch. Magnus was the ‘ground man’ to guide branches securely to the ground without touching either the caravan or the shed. and is the most appropriate yarn (and patterns) to work with. She works hard on the croft while she is here, even helping to clean the lean too and preparing it with clean bedding. 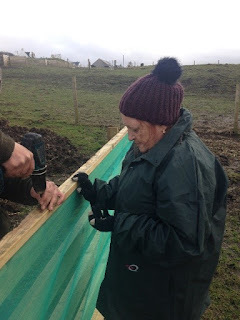 She was also on hand to help Kapitein (on a very cold day) with the windbreak around the vegetable plot. It was so cold, she even shared her hat with Sammy!! My next adventure was off island for another very special occasion. 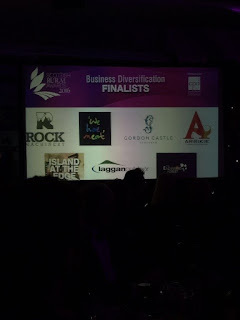 I had been nominated in 2 categories in the Scottish Rural Awards – Business Diversification and Rural Enterprise. 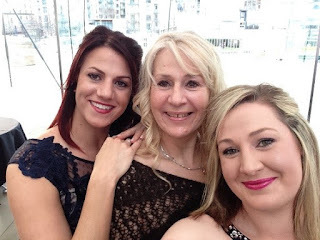 The ceremony was held at Dynamic Earth in Edinburgh and both of my daughters, Dionne and Nelly agreed to travel from Northumberland and come with me, sadly Kapitein had to stay at home to look after the sheep, dogs and hens. Dionne, Me and Nelly all dressed up for the ceremony. 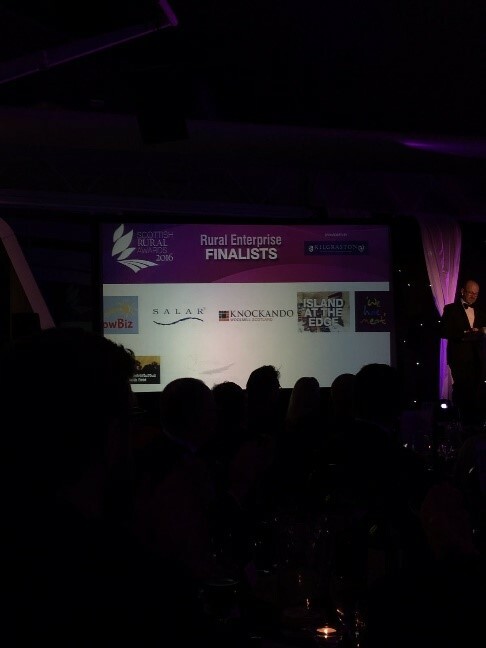 I was truly amazed when ‘Island at the Edge’ was chosen from hundreds of nominees to become one of the 6 finalists in the two nominated categories. 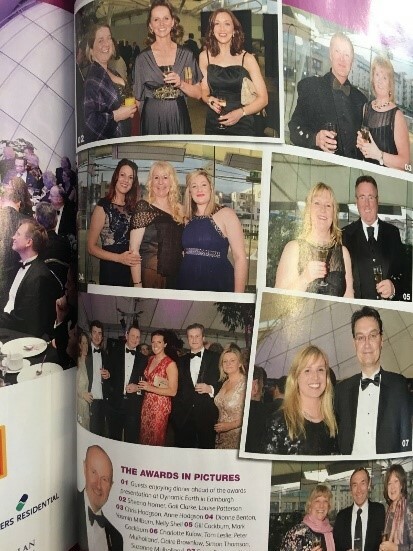 We were told this was a fantastic achievement and we all enjoyed the evening, I shan’t forget it in a hurry – we all had a lovely time, and we met some other small start off businesses from the Outer Hebrides too. While I was in Edinburgh, I went to visit Gordon NicolsonKiltmakers on the Royal Mile. Gordon is who made Kapitein’s kilt in our Tattersall Tweed. He is currently piloting a new venture, ‘Kilt School’ a SQA (Scottish Qualifications Authority) Qualification to make kilts. 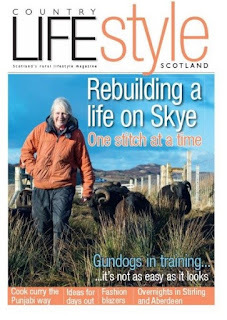 We have been in discussions about running this course up here on Skye at Island at the Edge. And for me to offer Traditional Dress Hire and kilt making facilities here too. This is a wonderful opportunity and will develop further during 2017. Lambing started in earnest with ‘Guffy’ having twin lambs, closely followed by another ewe lambing just as the most horrendous snow storm hit!! Thankfully the girls were in the lean too so were more protected than in years before. 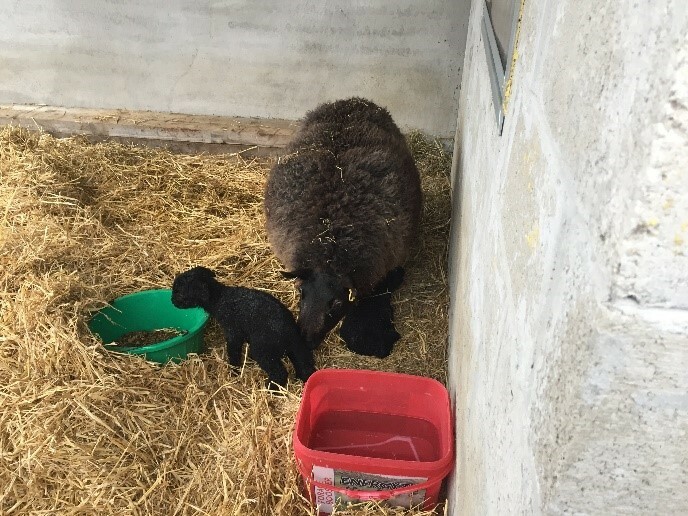 We had an interesting lambing this year, what with Mastitis, breach births – back legs first, difficult twins it just went on and on. We were thankful when lambing ended and we counted our blessings. We received our very first large ‘group’ of visitors here on the croft, comprising of Rare Breed sheep breeders all the way from Germany. We spent three days prior to their visit getting everything ready. 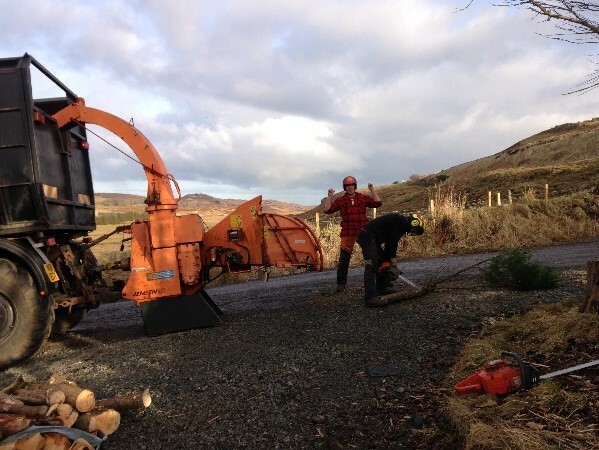 Kapitein had a couple of helpers and together they tidied up the whole croft and stacked logs neatly away. 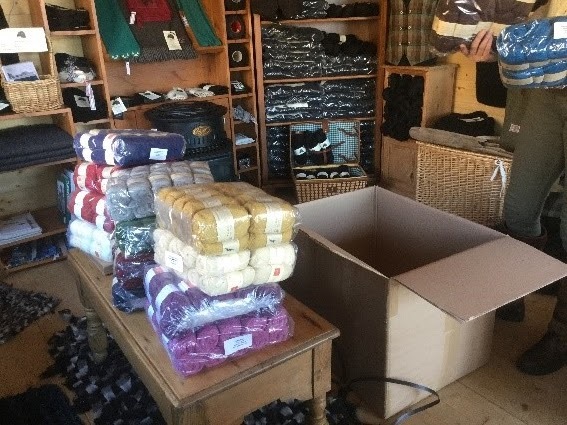 I prepared fleeces and rovings (wool prepared for spinning) for a spinning demonstration in the agricultural shed, got my shed ready and gave Kapitein’s kilt a much-needed press in anticipation of our visitor’s arrival. Our dear friends and helpers all arrived just before the earlier than anticipated arrival of the bus. 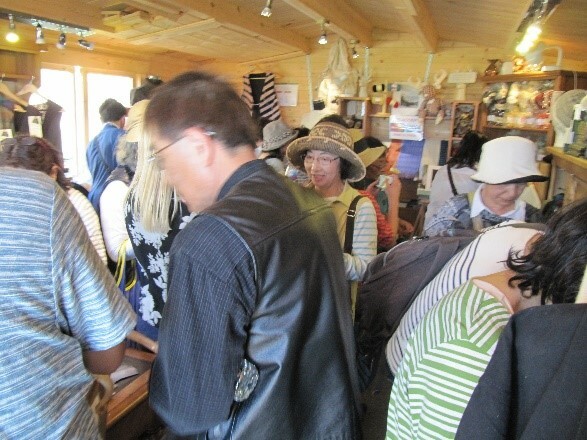 We had 37 people and one guide arrived at 09:00 in the morning. 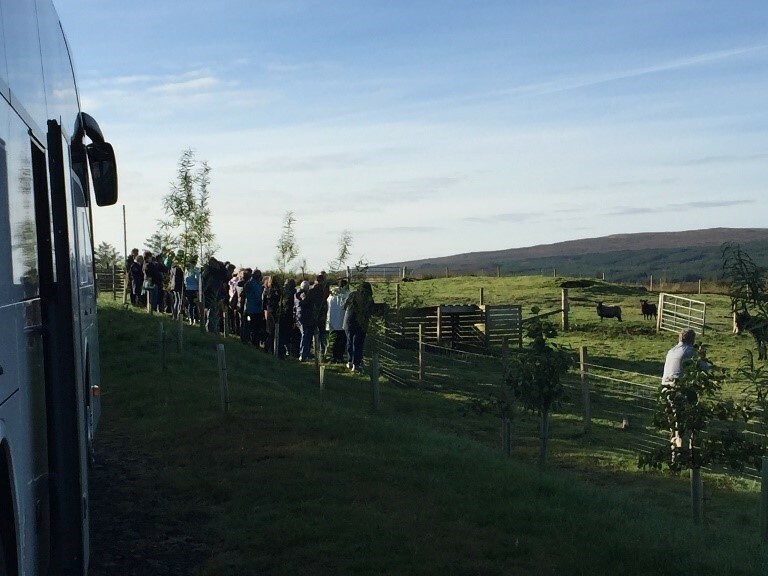 They managed to park their huge 55 seat coach off road at the entrance to our croft. And then we divided them up into 3 groups so Kapitein could take one to show them around the croft where they got to meet the sheep including lambs in the lean too, one of our friends had the second group and took them where they were shown how to spin and saw demonstrations about the differences between the fleeces and myself and Sarah had the remaining group and showed them how to knit a Gansey telling them all about the heritage and what the motifs mean (the designs knitted into the garment). The groups were amazing and huge fun, we all laughed a lot and they presented us with books, literature and a small hand woven mat made with their own wool as a farewell gift, what a lovely thought. They left at 11:00 am and traveled to Dunvegan Castle where another warm highland welcome awaited them. We all had some hot soup and coffee for lunch as we waited for the next group of 41 and 2 guides arrived at 1:30pm. They too parked their huge coach up at the gates and were divided into 3 groups. And again, this group were amazing fun and as the first group, presented us with some lovely gifts. 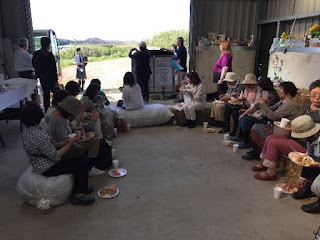 We were all very pleased that they had enjoyed their day, as we had too, but as we waved off the final coach at 4:00pm, we all needed to sit down and have several cups of tea as we reminisced about the day. Not resting on our laurels. 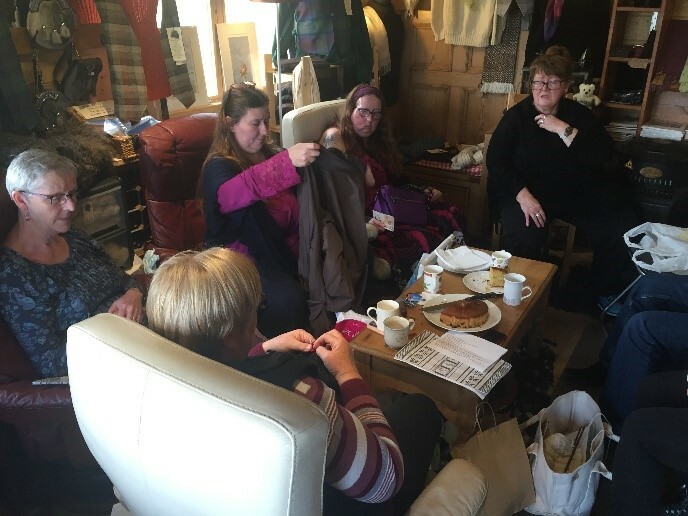 We have been running several courses on everything from learning to crochet and knitting to a first for us an introduction to spinning. This course was run by our friend Anne Salter, a renowned spinner and teacher of this skill. 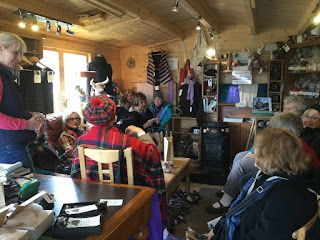 We all learned about choosing the right fleece, preparing a fleece and spinning with a spinning wheel, a drop spindle and another spinning device that Anne has invented – based on a football rattle. 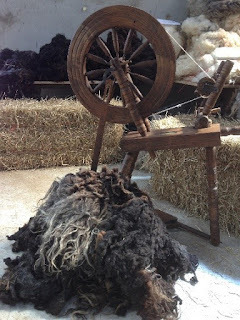 All of us had a wonderful time and we even managed to spin some fleece into wool. 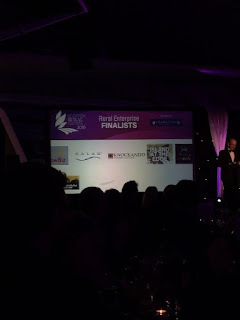 You may remember I was a finalist in the Scottish Rural Awards. 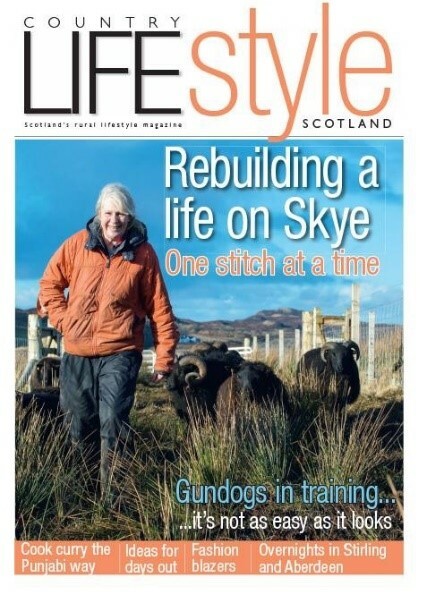 Well, my daughters and I made it into the ‘people of note’ section of the Scottish Field magazine during this month!! One of our customers has likened this to being in the ‘Hello’ or OK magazines!! Either way we all feel very privileged indeed. We had a mini heatwave here on the Isle of Skye. This has been recognised by the Met Office that we were the hottest place in the whole of the British Isles with temperatures of 27c!! What a coup this was. Whilst the sun shone, we welcomed another group of visitors here to the croft. 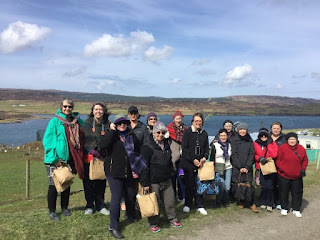 They came on the cruise ship Zuiderdam which came into Portree harbour and one of our tour operators, Tour Skye brought on a pre-booked tour, several groups of ‘knitting and craft’ ladies and gentlemen here to the croft. One very, very special lady arrived with the first group. A very famous lady called Hazel Tindall – she is the world’s fastest knitter and has held this record since 2004. 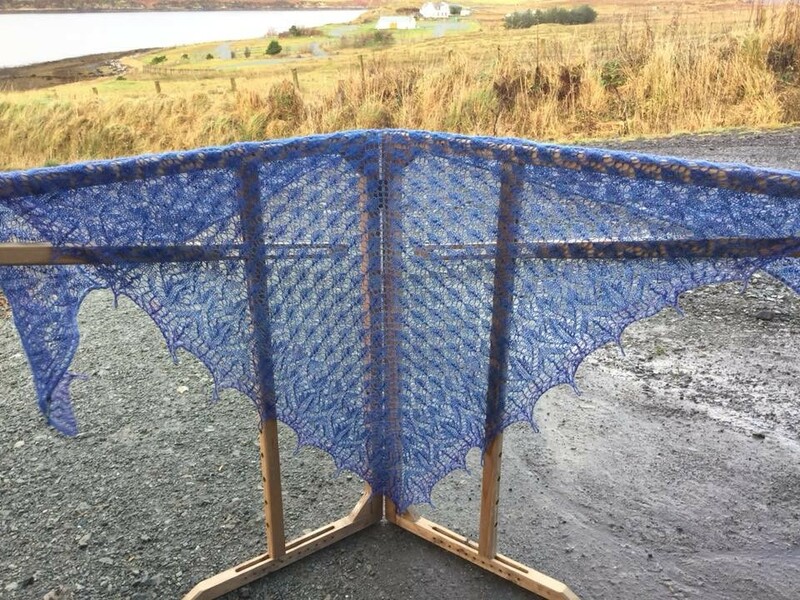 She knits with the wonderful Jamiesons and Smith’s Shetland yarn and she knits Fairisle. 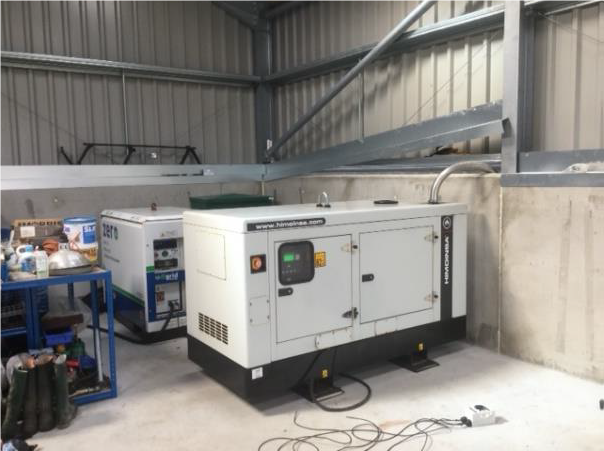 Ably assisted by Calum MacRae, joiner extraordinaire, the Generator was swiftly moved into the shed. The battery pack has taken a battering through the 2 years it has been outside, so this is the best option. 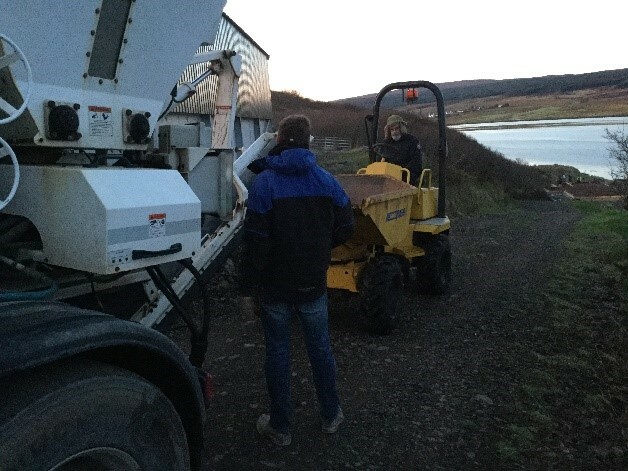 We waited with bated breath for the arrival of our KederGreenhouse. Kapitein had been working for several months getting the foundations ready. This was a very precise job, and we really hoped everything would fit when Dean and Lee from Keder were setting the framework down. We watched the weather forecast and realised that the wonderful heatwave we had been enjoying was coming to an end!! This didn’t mean a storm was brewing, but more of the ‘usual’ misty and wet weather we usually have here on Skye with a slight 30-40 mph breeze. The following morning the boys arrived on site at 7.10am and started work immediately. 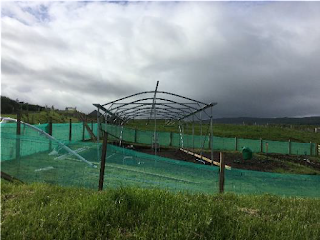 I can honestly say, I haven’t met such fast and precise workers for a long time – they put up these greenhouses on a regular basis, but to watch them work was amazing. And since they have installed it, Kapitein has planted several seeds, bedding plants, slips and cuttings so we can ‘hopefully’ have our own vegetables this year. Until then, Bliadhna Mhath Ur - Happy New Year.